You have probably heard of Cuenca. 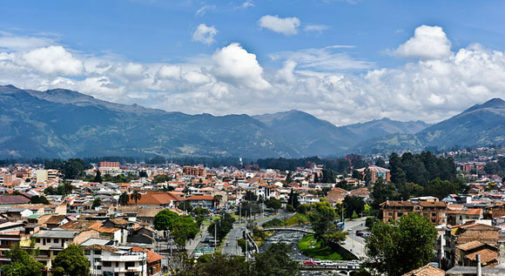 It’s Ecuador’s most popular retirement haven, home to thousands of contented expats, colonial architecture, verdant parks, galleries, museums, and plenty of bars and restaurants. Horseback Riding in Tarqui: When I first came to horseback ride at Hacienda Totorillas (a 45-minute drive south of Cuenca in Tarqui), I was surprised. I’ve ridden horses in the states but exploring Andean mountain landscapes from the back of my mount, Volcano, was an unforgettable experience. Ride through dense forest on trails used by locals for hundreds of years, spotting tiny orchids and bright yellow flowers called “baby slippers” along the way and stop high in the hills where breathtaking vistas seem to stretch forever. Horses are always matched to the experience of the rider, and the guides like Adrian Mora are bilingual and love to share their knowledge of the flora, fauna, and history of the area. Group tours $60 pp; private tours $80 each for two riders. Two Worlds of Yunguilla: After driving an hour outside of Cuenca through the verdant Yunguilla Valley you arrive at an impressive waterfall called El Chorro de Giron. Located in a misty cloud forest, the base of the waterfall is reached after a short hike through ferns and bromeliads. Then, less than an hour’s drive south you wonder how it’s possible that you find yourself surrounded by cacti in the Jubones desert. This area is a hidden gem that many locals don’t even know exists. El Chorro can be reached by local bus but to reach Jubones you need a car. Terradiversa offers full day private tours for $112 per person (for two guests). Piedra de Agua: You’re pooped after all of your adventures and just need to relax. This beautiful spa in the hills right outside of Cuenca has all the pampering amenities you need. Thermal pools, mud baths, steam, massage, skin treatments, gourmet restaurant. The spa can be reached by taxi (about a $5 fare) or the #11 bus drops you off a short walk from the entrance. Go on Monday from 11 a.m. to 5 p.m and take advantage of their 2-for-1 special ($30 for a couple).